As a minister, writer and speaker for more than fifty years, Norman Vincent Peale touched the lives of millions with his words of faith and encouragement. Here in gift book format, are excerpts from Dr. Peale's sermons and writings on the power of joy in our lives. His message will uplift and inspire readers--and the format is ideal for gift giving. - Publisher Throughout his years as a minister, and in his speaking and writing -- including authoring 'The Power of Positive Thinking' -- Norman Peale touched the lives of millions. In this offering from the 'seeds of faith', readers will have the opportunity to learn Doctor Peale's message on the power of joy in our lives. 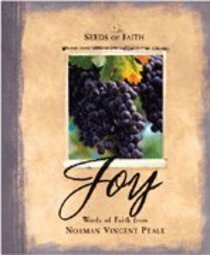 About "Joy (Seeds Of Faith Series)"
Throughout his years as a minister, and in his speaking and writing -- including authoring 'The Power of Positive Thinking' -- Norman Peale touched the lives of millions. In this offering from the 'seeds of faith', readers will have the opportunity to learn Doctor Peale's message on the power of joy in our lives. Clergyman and author Norman Vincent Peale was born in Bowersville, Ohio, on May 31, 1898. He was ordained into the Methodist Episcopal Church in 1922 and served as a pastor in a variety of churches in the eastern United States for the next decade. In 1932, he joined the Dutch Reformed Church and became the pastor of the Marble Collegiate Church, a post he would hold for more than fifty years. Peale's book, The Power of Positive Thinking, has sold more than fifteen million copies and been translated into forty languages. It helped create a viable market for self-help books. In addition to writing, he gave sermons on both television and radio and published Guideposts, a very successful weekly newsletter. He died on Christmas Eve, 1993.